Have you ever seen an author tear a page out of their own book onstage? On Wednesday, Oct. 25, Tyehimba Jess, winner of the 2017 Pulitzer Prize in Poetry for his book, Olio, did just that. 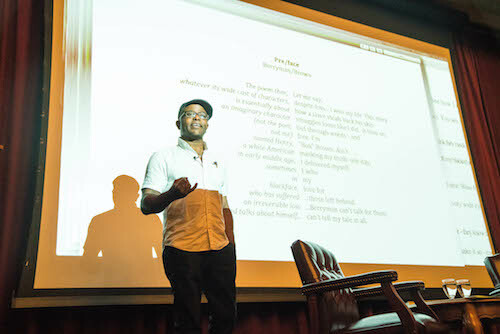 Jess, an author and professor, read and performed Wednesday evening at the Soda Center, as part of the Creative Writing Reading Series hosted by the MFA in Creative Writing Program. His reading was followed by a Q&A with poet and Associate Professor of English Matthew Zapruder. Olio is an innovative and unique work of poetry that examines the lives of black minstrel performances. On the concise and apt title of the book, Jess said, “Olio means a mix, a melange of ingredients that come together to form a meal. In the context of American theaters, the Olio is the middle part of minstrel show, in which a variety of acts would appear.” Jess said that minstrel shows were started by white performers to create two-dimensional pictures that were caricatures of Blackness, and a type of “psychological warfare” and “entertainment” that was “uniquely American.” Jess subverts this viewpoint by creating poems about the first freed Black Americans who pursued art and creativity. Jess introduced the attendees to a few minstrel performers, crafting unique poetry from their perspective and point of view. The first performers that that Jess describes are Millie and Christine McKoy, conjoined twins who began their lives as “freak shows” for their slave owner, who profited off audience members’ perverse curiosity. Millie and Christine were poked and prodded by quack doctors, ridiculed, and made to be a spectacle. However, as they grew older, they were talented and hardworking. They sang, danced, and played multiple instruments. Jess tells their story through a series of syncopated Shakespearean sonnets. Since Millie and Christine were pygopagus, joined at the hip, they were always together. Jess reflected this in his poems about Millie and Christine. They start with two separate perspectives, and meet in the middle. The poems could be read backwards, forwards, straight down, from the bottom up, and whichever way the reader wished. Five poems were written this way, and in Olio, the page folds out to reveal a syncopated star: five poems that could be read in any direction at the reader’s discretion. The concrete shape of the poem forms a likeness of Millie and Christine’s joined bodies. Later, Jess read the Bert Williams/George Walker paradox. According to Jess, Williams was a loved musician, and George Walker was a comedian. They were a famous duo who worked together, and Jess creates a poem in which their perspectives are side by side, like stand-up comedians. Williams’ side repeats the word “nobody” in every dyad, and Walker’s side repeats the word “face” in every dyad. The Bert Williams/George Walker Paradox is a recursion. Each set of two lines can restart into the next one. This concept is repeated in the physical form of the poem. Onstage, Jess asked for a volunteer, and he tore the “Paradox” poem out of the book. When folded in half and formed into a circle, the poem is still readable and forms a coherent narrative.